Anything from the Savoie region in France usually involves cheese –lots of it. This omelette is no exception. 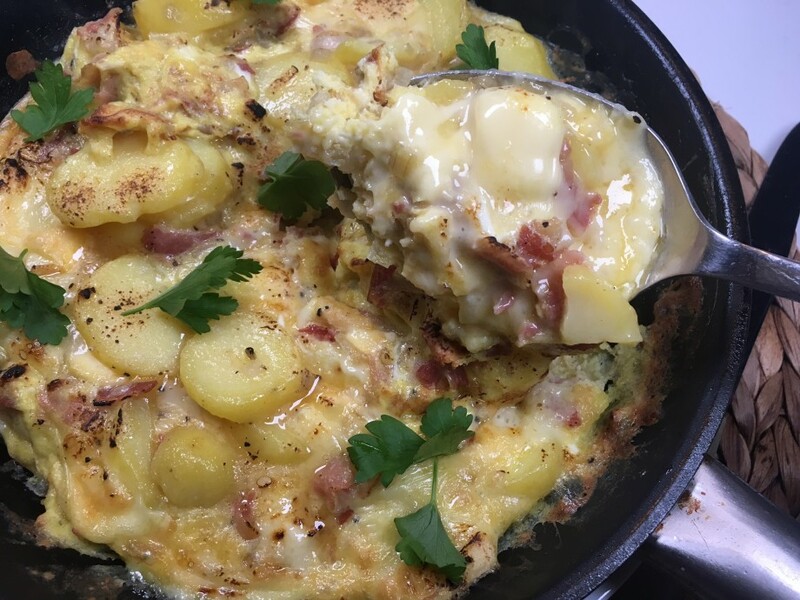 This dish is just the ticket if you have been swooshing down the slopes on a freezing day; if you’ve been sitting on the sofa filing your nails it is harder to justify eating your bodyweight in reblochon-but no matter because it is not something you eat every day. You could make the omelette with raclette cheese but I prefer reblochon for its meadowy flavour. Halve the potatoes and cook in salted boiling water for about 15-20 minutes until just cooked through. Cool and peel away the skins. Cut into 3mm thick slices and place in a mixing bowl. Set aside. Fry the pancetta in a frying pan for 3-4 minutes until golden brown-you shouldn’t need any fat. Tip into the mixing bowl with the potatoes. Heat 15g butter and the oil in the frying pan and gently cook the shallots for about 10 minutes until soft and very lightly coloured. 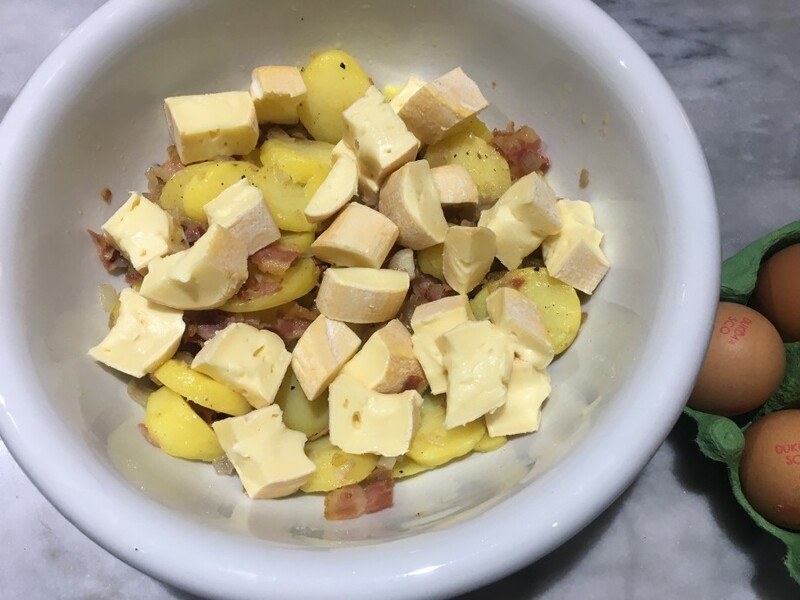 Mix with the potatoes and pancetta. 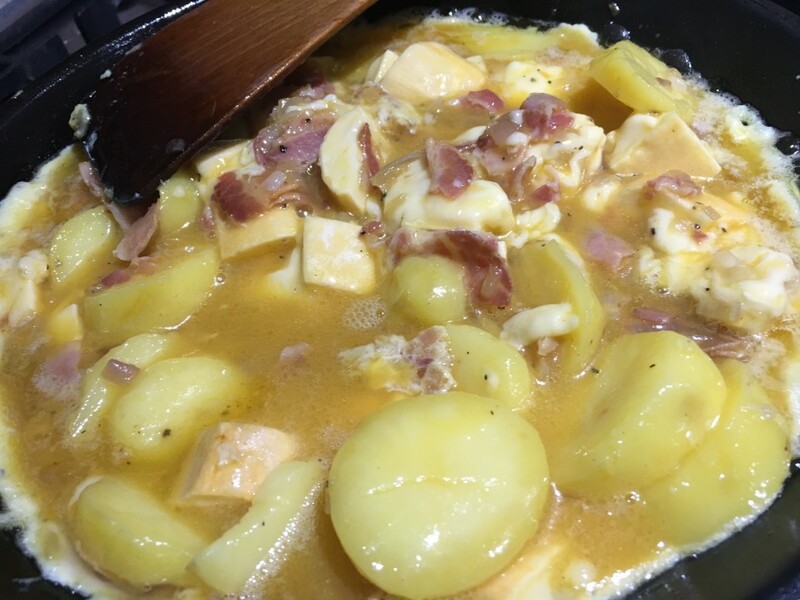 When this mixture is barely warm add the cubes of reblochon-too hot and they will start to melt. Heat the grill to high. Season the eggs well with salt and ground black pepper. Pour over the potato mixture and stir well. Heat the remaining butter in the frying pan. Tip the contents of the mixing bowl into the hot frying pan and cook for one minute until the sides are starting to firm up. Gently draw the outside edges towards the centre and tip any runny egg into the gaps. Cook for 1-2 minutes then place under the grill to brown the top. Serve immediately, with a little parsley sprinkled over the top of the omelette.